I'll admit it - I'm a pasture geek. I get a huge thrill out of seeing grazing animals go into a new pasture. There's something thoroughly relaxing about the sound of ruminant animals munching away on fresh feed. I'm always curious about the way in which individual animals select the plants they prefer to graze. 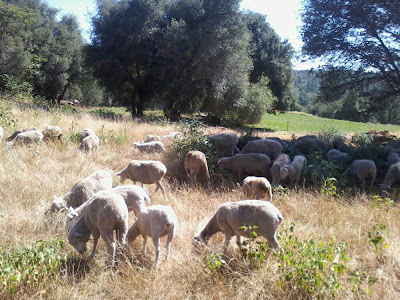 Over the last week, we moved approximately 300 head of sheep from Rocklin up to Grass Valley. In each new pasture they entered, we were able to observe (at least briefly) their dietary preferences. At the Elster Ranch, the ewes consumed prickly lettuce, cocklebur and starthistle. When we moved them to Sierra College today, they seemed to prefer the starthistle and blackberries. I think my friend (and our local farm advisor) Roger Ingram must be a pasture geek, too. He helped me move our lambs onto fresh feed this morning. We were thinking that we'd need to move them onto some dry grass to allow our irrigated pasture to recover from the last grazing. However, when we arrived at the ranch, we were pleasantly surprised to find the irrigated pasture ready to be grazed again - after just 21 days of rest. Roger remarked later in the day how pleased he was about the grass growth. Always interesting to learn what makes a pasture geek happy! Roger and I are looking for some high school or college students who are also pasture geeks! We'd like to have students observe an individual sheep for a full day and record their grazing preferences and other activities every 15 minutes! Anybody out there who wants to watch sheep eat?! Maybe we'll make Pasture Geek t-shirts!